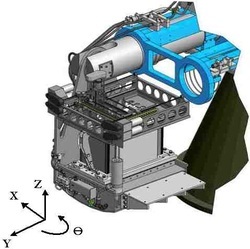 CRM-4 Four-Axis Robot - PVL Technologies, Inc.
conducting sophisticated dynamic model tests. structures, inserting piles, depositing and excavating soil, grouting, soil contouring and profiling, and use of penetrometers to characterize soil properties in-flight. 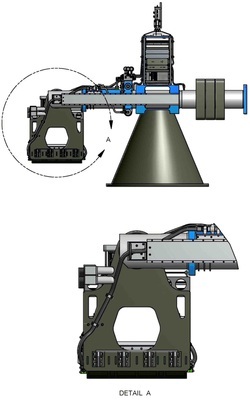 Due to weight and space limitations, such single-purpose actuators were typically mutually exclusive and could not be used in combination during a single test. - first-generation robots utilize standard robotic tool holders which are large in size, limiting the number of tools that can be cached in the limited space available on the centrifuge arm. 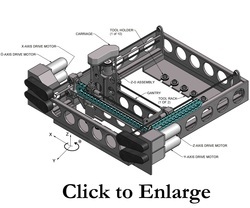 In spite of their large size, standard robotic tool holders tend to be relatively weak, limiting the forces that can be applied to the tool. - the CRM-4 uses tool holders designed specifically for the severe centrifuge environment, providing high strength and rigid connections in a very compact space. - Includes a ‘starter toolkit’ consisting of 4 tools: one each of a laser displacement sensor for surface profile measurement, a Piezocone 3 cone penetrometer ,a gripper tool to grab and move small parts around the model, including capability for pushing model piles into the ground, and a fluid injector to penetrate the soil and inject fluids at different depths.